This is the first of a new monthly series of blog-posts on Alliums for the Month, which, like my previous series on lettuce and Asian greens, I plan to run for a year. Alliums are the onion family. With this series, I’m going to talk about which alliums to harvest each month, which to plant, and which need other kinds of attention. 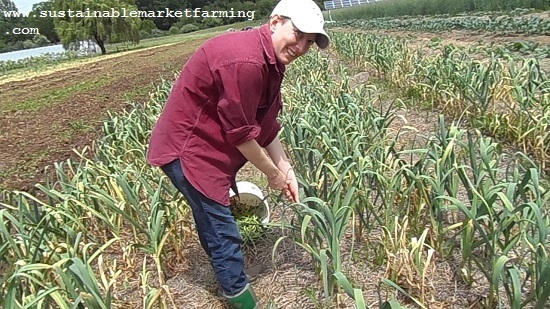 Starting any day now, we will begin harvesting garlic scapes (the firm, edible flower stems of hardneck garlic). My previous posts about scapes are some of my most popular ones. 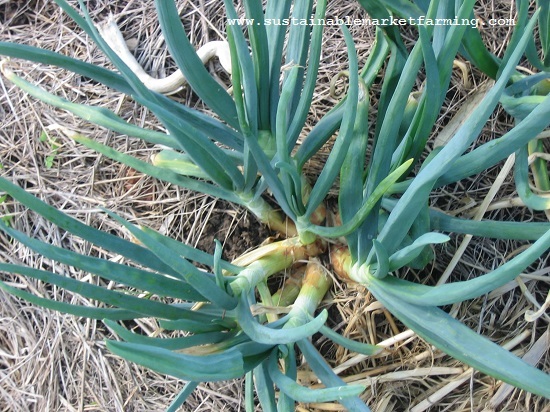 See last year’s Garlic scapes, upcoming events, hoophouse seed crops, posted on May 2, 2017. There I noted that in 2017, scapes came early, as did Tulip Poplar flowers, at the end of April. We harvest scapes two or three times a week for about three weeks, until no more appear. Garlic scapes are one of the first outdoor crops of the year, apart from rhubarb and asparagus, and their flavor is refreshingly different from leafy greens (the staple hoophouse crops of early spring) and stored winter roots. I posted Garlic scapes! 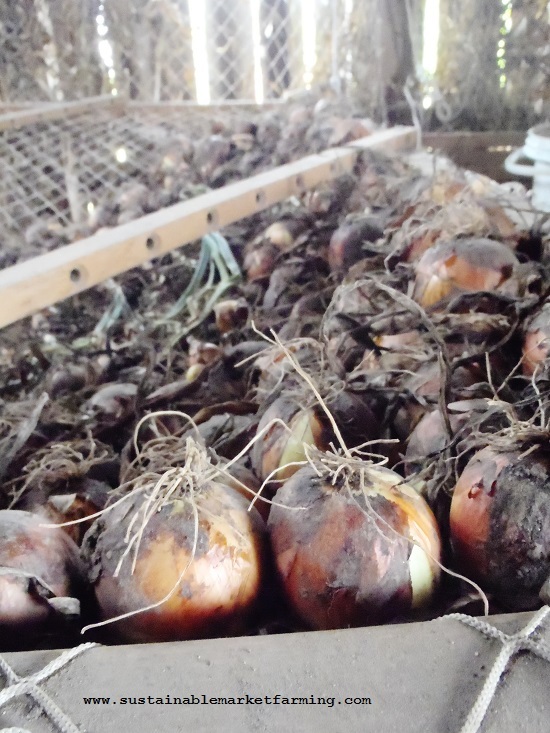 Three weeks to bulb harvest on May 11, 2015. That year scapes were later than average. This post is a very popular one, and I’m still wondering if I was over-confident in predicting 3 weeks to bulb harvest everywhere in the US! Please do leave a comment if you have records for how long you get between scapes and garlic bulb harvest. 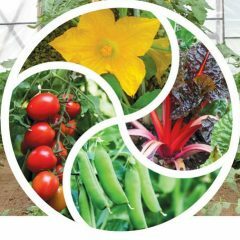 I’ve done some research into what triggers flowering in garlic, but haven’t found much solid info yet. In general, plant flowering is triggered by some combination of enough vernalization (chilling hours during the winter and early spring – maybe 10 weeks below 40F), plant maturity, temperature and photo-period (the relative length of day and night). In cold weather the plants suppress the flowering signal. The leaves perceive the amount of daylight, and when the temperature is also right, they trigger flowering by sending a signal (called Florigen) to the shoot tips. Florigen may be an actual compound, or may be some combination or ratio of several plant hormones, produced by one or more genes in the plant. Almost all these factors are outside our control, once the plant is in the ground, so the best we can do is pay attention and be ready to act. There is a bit more information about the triggers for bulb initiation and for drying down. Garlic bulb initiation (and the end of leaf growth) is triggered by daylight increasing above13 hours in length (April 10 here at 38°N). Soil temperatures over 60°F (15.5°C) and air temperatures above 68°F (20°C) are secondary triggers. When I was in Jamaica last May, I researched growing garlic in the tropics, and it may be that temperature is a bigger trigger and daylength is less important in tropical latitudes where daylength does not vary much. Certainly some growers had produced garlic when I didn’t expect it to be possible. 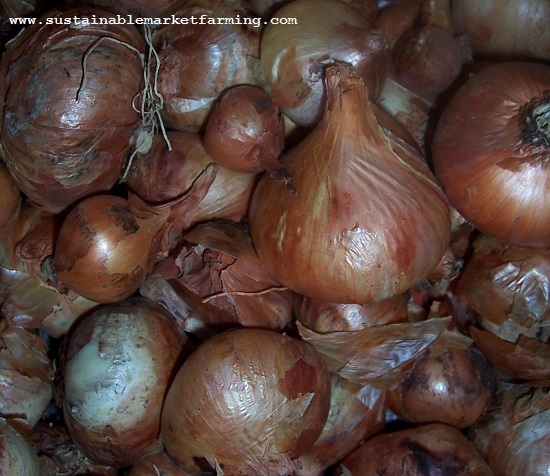 Hot weather above 91°F (33°C) ends bulb growth and starts the drying down process. I don’t yet know how many hours over that temperature the garlic needs before drying down is triggered. We had a few very hot days last week. It is important to get plenty of good rapid growth before conditions prevent any more growth. 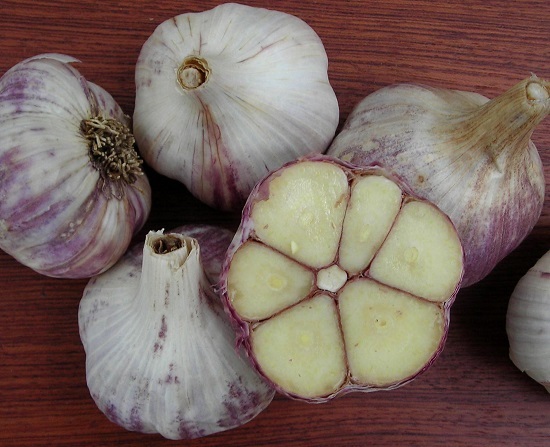 Garlic can double in size in its last month of growth, and removing the scapes (the hard central stem) of hardneck garlic can increase the bulb size 25%. 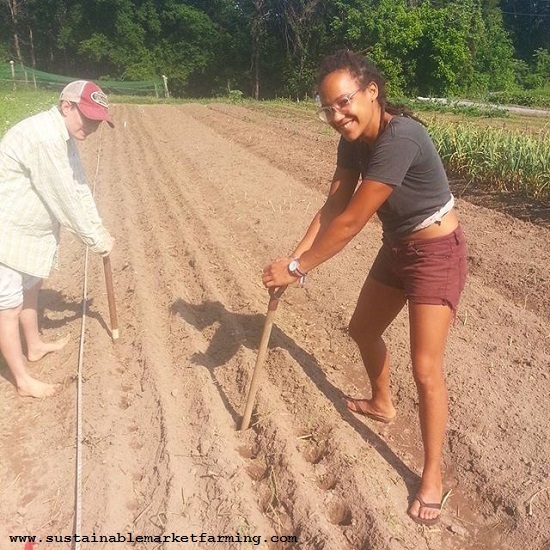 In the 2015 post I described how we pull our garlic scapes, to get the most out–we love this crop! We also appreciate a late-morning task that’s done standing up! In that post I described the value of mulch and when to remove it. Garlic scapes to cheer us up posted on May 10, 2013 has been reread a lot–whether that’s because readers love garlic scapes, or seek cheering up, I can’t say. 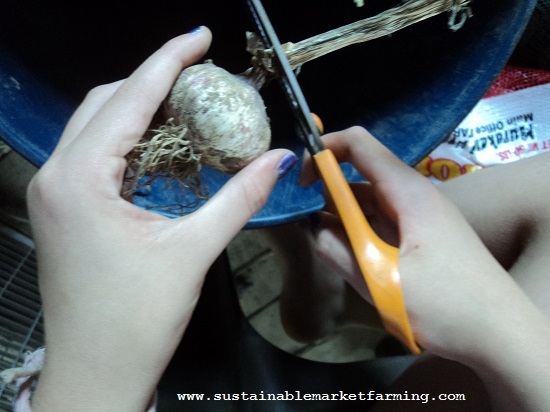 Pulling garlic scapes – the long view. Here’s the short version. Those looking for more detail can go to my 2015 post. When scapes arrive, plan some late morning or early afternoon time two or three times a week to harvest them. As soon as the pointed cap of the scape has emerged above the plant center, firmly grasp the stem just below the cap and pull slowly and steadily straight up. The scape pops as it leaves the plant and you have the whole length of the scape, including the tender lower part. Gather them into buckets, with the scapes upright, so they are easy to bunch or cut up. Put a little water in the bucket. They store well in a refrigerator for months if you don’t use them sooner. In a few days, more scapes will have grown tall enough to pull, and you can have a second chance on any that broke at your earlier attempt. 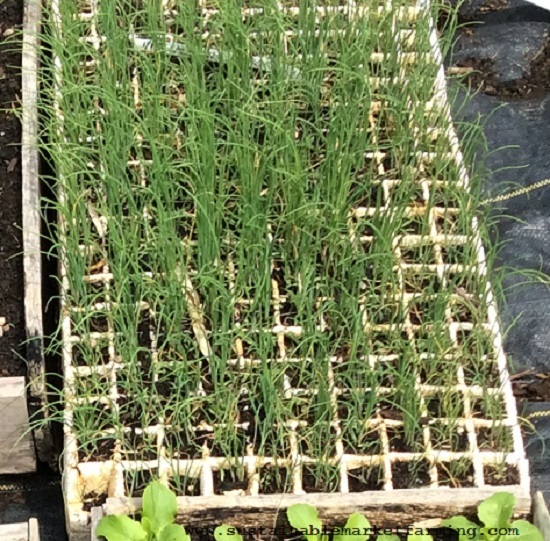 Clumps of scallion transplants in a Speedling flat, ready to transplant earlier in spring. 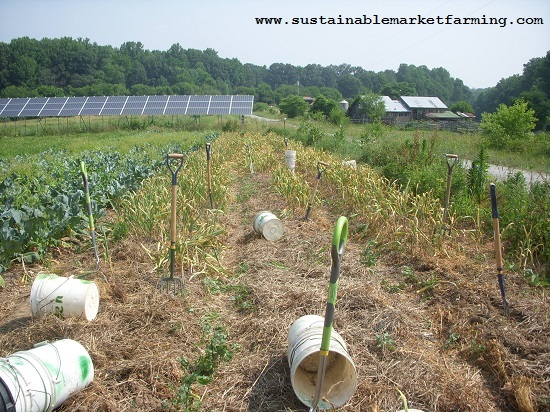 To harvest, we loosen the soil with a digging fork, then lift out a clump. We shake the plants, keeping them in a cluster, and trim off the roots and the ragged tops. Holding the bunch in one hand, we pass the scallions one at a time to the other hand, pulling off a single outer leaf and giving the base of the plant a wipe with our spare hand. Next we set the scallions in a small bucket in water. When the bucket is full enough, we dunk the scallions up and down, and transfer them to a clean bucket with a small amount of water to keep them fresh. 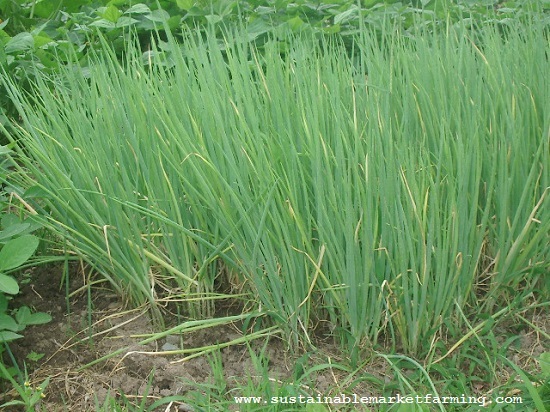 Scallions planted in bunches, ready-to-harvest. It’s good to develop an efficient method with little scallions or the harvest takes way too long. Deal with scallions in bunches as much as possible (digging up, trimming), rather than one at a time. Pass them from hand to hand when cleaning rather than set them down on the ground and pick them up again one at a time. Set them into water so they are cleaning themselves while you work on the rest. Don’t fuss with them too much – pull off a single outer leaf, not more. Don’t pick at little bits of skin, unless quite gross. If you are going to band them, start out with a bunch of rubber bands around three fingers on the hand that holds the bunches (leaving the forefinger free for tasks demanding dexterity). When you’re ready to band them, use the other hand to pull a rubber band into position. Roxbury Farm in New York State has a wonderful Harvest Manual. Page 45 on scallions says they harvest 50 bunches an hour, including trimming tops as needed, but not roots. They wash 100 bunches an hour on a bench, in bunches, with a power spray. A potato onion plant in early spring, showing the cluster that has developed. Potato onions (Allium cepa var. aggregatum) are a type of hardy, perennial multiplier onion–once you have them you are self-sufficient. You don’t need to buy seed each year, but select the best bulbs from the ones you grew to replant for the next crop. Also known as Hill Onions, Mother Onions and Pregnant Onions, they produce a cluster of tasty (but not too pungent) bulbs from a single planted bulb, or a large bulb from a small one. 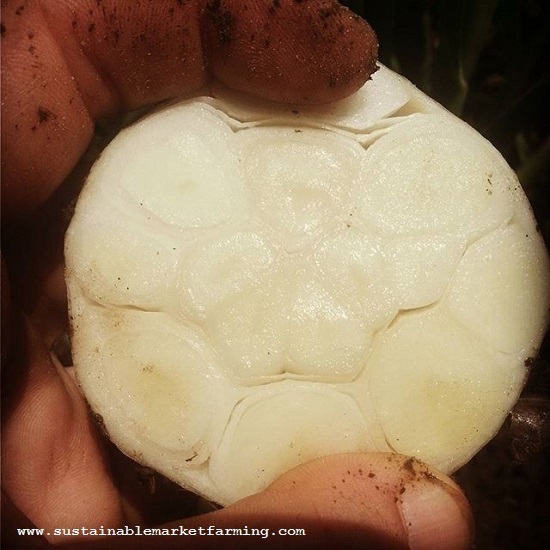 Potato onions have good drought resistance, pink root resistance, onion fly resistance and are widely adapted for different growing regions (not Florida or southern Texas). When properly planted they can withstand sub-freezing temperatures in every area of the continental U.S.
You can order potato onions from Southern Exposure Seed Exchange and other suppliers to be shipped in the fall. See SESE’s Perennial Onion Growing Guide and Garlic and Perennial Onion Growing Guide for growing information. The potato onions which were planted earliest (September for us) will be ready to harvest first, at the end of May or early in June in our central Virginia climate. Once you see the tops start to fall over, stop watering the onions and let them dry down. Potato onions are ready to harvest when the tops die. Not all will be ready the same day. Because onions easily get sunscald if left exposed after they are mature, it’s best to harvest the mature ones every few days. Don’t break over the tops in hopes of a single harvest–it really reduces the storage life. 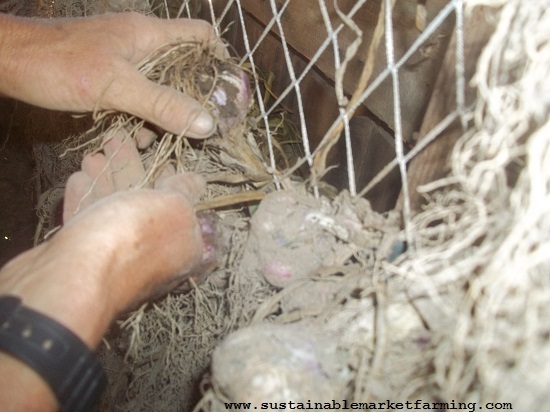 The potato onions sit on the surface and are easily picked up without tools. Handle them gently, to prevent bruising and scratching. Put them into crates or buckets, without pulling off any leaves. 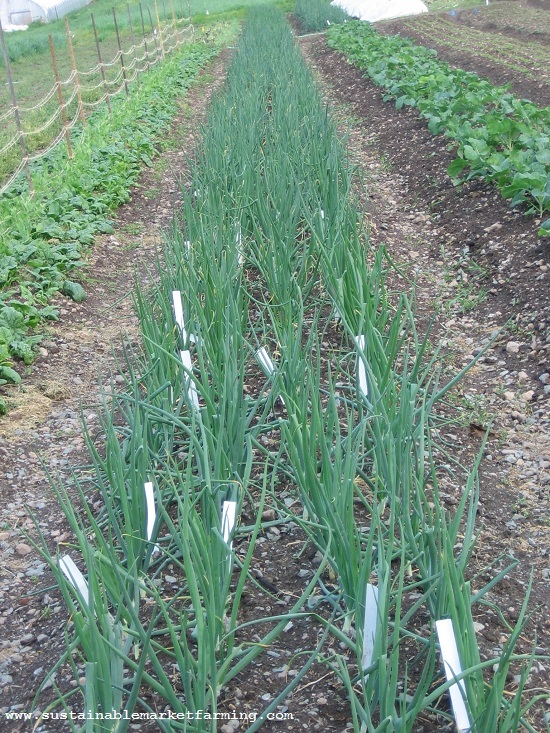 The September planted potato onions were the largest bulbs when planted, and they will usually have divided and produced clusters of small onions. Do not break up the clusters as you harvest, because this triggers sprouting. Set the clusters in a barn or shed, on an airy bench or horizontal rack. The tops break easily, so you cannot hang them as you might hang garlic. Potato onions need good ventilation: we use box fans continuously. 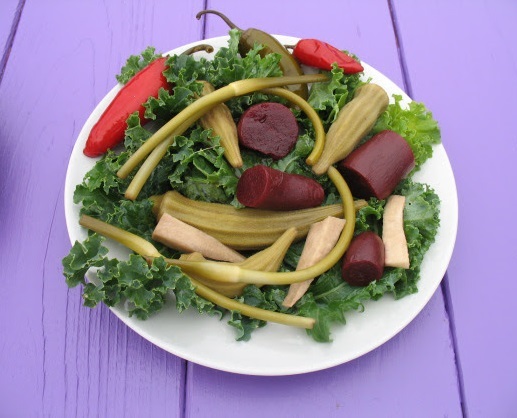 If you find any bulbs larger than 2.5″ (about 6 cm), go ahead and eat those. The giants do not store well. Alternatively, refrigerate them till September and replant. 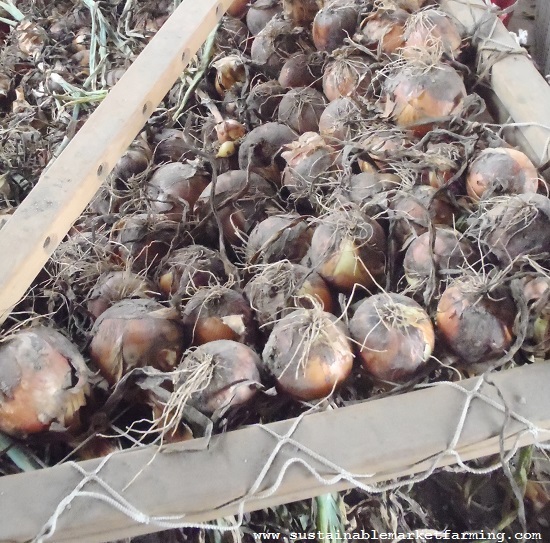 The small and medium-sized bulbs keep 8-12 months under good conditions, and are the best to replant to grow more onions. 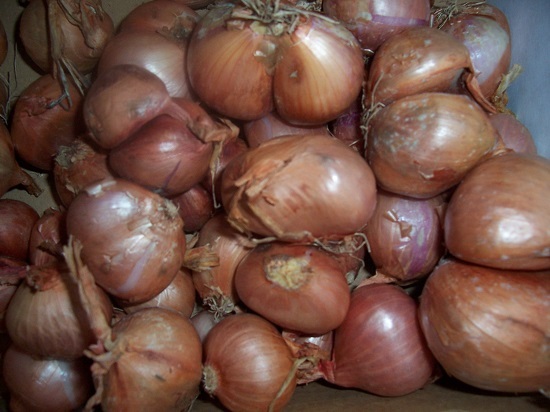 Potato onions need sorting about once a month to remove any that are rotting. We plant our large ones in September or early October, our medium-sized ones in late November and our small ones in late January. I’ll tell you more about those when the time comes. 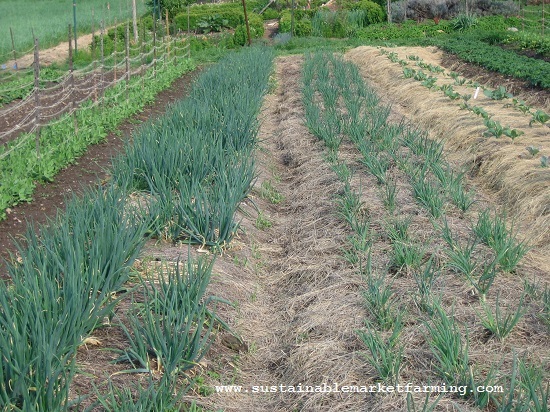 Two beds of potato onions in spring, of different planting dates.